Jagatram Niwas is open throughout the year. The warmest season is from mid-March to July, followed by the monsoon which runs until around the end of September. October and November see many sunny, warm days and cool evenings, and December to mid-March are often cold with the chance of snow, but still many sunny days. Our bed-and-breakfast rates are per room, as opposed to per person, and include tax. 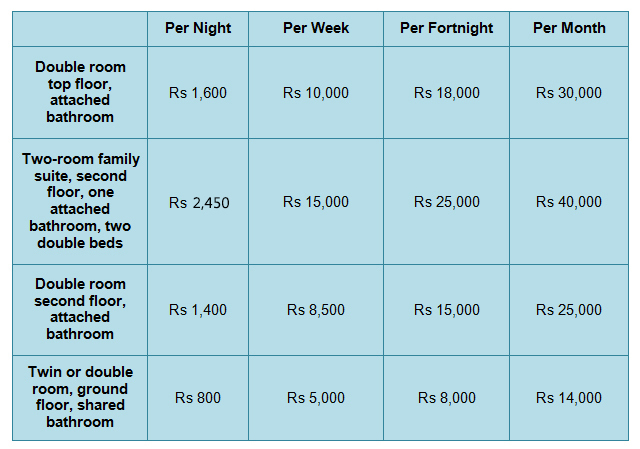 One extra mattress and bedding can be provided in any of these rooms at the cost of Rs 400 per night, including breakfast and tax.